Dovecraft Berry Blush 8 x 8 Paper Pack, Ribbon and Glitter Dots. 1. With your laser printer, print your free template in black ink onto an A4 sheet of First Edition Ultra Smooth card ready to foil. Make sure the printer is set to the maximum ink coverage setting. 2. Pick your First Edition foil to cover the design. Layer the foil on top of the design, silver side facing down and cover with a piece of plain white A4 paper so you cannot see any foil. 3. Switch on your First Edition Foil Applicator and wait until the green light is on. Carefully pass the design through the machine. 5. Cut out your template, score along the fold line and adhere the flaps together using double sided tape. Alternatively, if you want a more detailed design follow the step below to make a more intricate money wallet. 6. 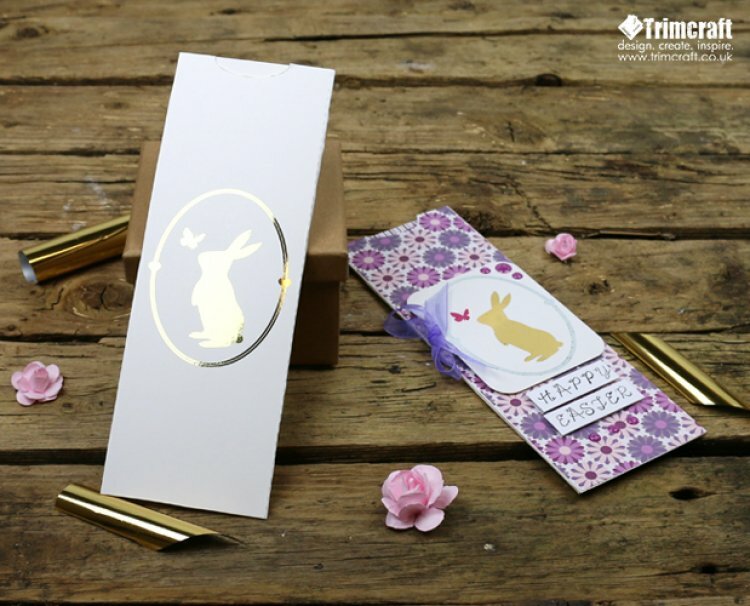 Cut out your foiled bunny design and leave it to the side. Print and cut out another money wallet template on plain card. To decorate, we’ve added strips of Dovecraft Berry Blush paper, ribbon, an Easter sentiment and a selection of Berry Blush glitter dots. You will certainly sweeten Easter with this foil bunny on your money wallet! If you like the design, you can use it on a number of projects and experiment using different coloured foil. How are you going to use our template? Remember to upload your wonderful makes to the project gallery!